40 years ago in times of tension the Helsinki process led to our decision to establish a forum for dialogue and cooperation with respect to security and stability in Europe. That was a unique decision, back in difficult times. Today, 25 years after the fall of the Berlin Wall, we are not reliving a cold war, but we do see serious situations threatening stability and security in Europe again*. In that light we should cherish the OSCE as a unique asset for dialogue and cooperation, especially in dire times. We owe this to a new generation, to the youth that called us to action this morning. As a values-based organization, the OSCE is the largest regional security organization under Chapter VIII of the UN Charter. It works on the basis of a comprehensive approach avant la lettre, in three dimensions: Politico-military, Economical, and Human Rights. All three are now at stake. In that context, we are rightly very concerned today. We see that the principles and values at the very heart of the OSCE – and laid down in its founding Act – are being violated, with the annexation of Crimea and the far-reaching interference in eastern Ukraine. First things first. Let’s start with confidence building measures. Let’s first ensure that our missions, like the ones in Ukraine, can work unhampered, on the basis of the agreements that have already been reached in Minsk. I would like to commend the Special Monitoring Mission in Ukraine for its outstanding efforts, including their support with regard to the MH17 disaster, which struck so many of us. The SMM’s role deserves special mention. The Netherlands is providing generous support to the mission. And I saw its courageous, serious and precise work when I visited Kharkiv two weeks ago. We should not leave them alone. The SMM should be able to completely verify the Minsk Agreement. And the OSCE should contribute to laying the foundation for a political solution in Ukraine, based on the principles of territorial integrity, national sovereignty, and the non-use of violence. This crisis shows we cannot take security and stability for granted, and that our principles, agreements and basic assumptions are suddenly being challenged. This has an impact on all of us. 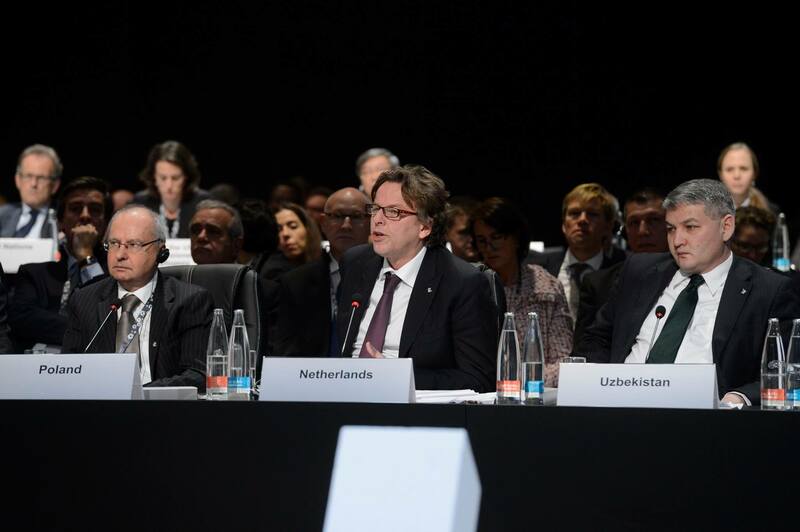 The Netherlands and other countries have been directly affected – through the MH17 disaster. This crisis underscores in my view the important role of the OSCE: indispensable for all countries concerned, without exception. We are here to thank the Swiss Presidency for its important and persistent work, and to welcome the incoming Serbian Presidency. We also welcome the launch of a Panel of Eminent Persons. This Panel will be tasked with a difficult job. With respect to human rights, I would like to underline that here too, there is a big job to do and I want to stress the important work of ODIHR, the HCNM and the Representative on Freedom of the Media. We also need to reach out to support human rights defenders in the OSCE area. Yesterday, I had discussions with human rights defenders. Their concerns are too many to list. I am very worried about the situation in different countries. There are many young people who struggle for the freedom of the press, and for space for civil society and fundamental freedoms every day. I do think that decisions proposed by the European Union on freedom of expression and freedom of assembly and association require further discussion. These texts were based on existing commitments, and I believe their failure is typical of the crisis at hand: agreements to which we all have committed are not being observed. On a more positive note: we are pleased that last year’s Ministerial Council adopted a first set of confidence-building measures for the use of IT in the context of international peace and security. Their implementation will be a challenge for the OSCE, and all of us have to work on this. The Netherlands will organize the next Global Conference on Cyberspace, to be held in The Hague on 16 and 17 April. The Netherlands is pleased with the OSCE’s focus on this subject. And finally, Mr. Chairperson, I call on all of us in the OSCE, and on our Permanent Representations, to think about new confidence building measures on subjects both old and new. We must not only uphold our principles, but also restore confidence and build trust amongst ourselves, speaking openly and frankly, enabling us to accomplish our common goals. Dit bericht werd geplaatst in Uncategorized en getagged met Crimea, MH17, OSCE, OVSE, Russia, Ukraine. Maak dit favoriet permalink.